rainbow cleaners is demolished and blue metal fences mark the perimeters of the construction site. soon the earthmoving machines will shove down the concrete foundations that remain, scrape away layers of contaiminated soil. and i wonder what fluids have leaked through the floorboards after 50 years of cleaning service? rainbow cleaners is demolished and there’s a big sign announcing new leasing opportunities. gone is the mid-century modern neon sign and the flat-roofed building with oversized plate glass windows, perpetually fogged with chemical residue. rainbow cleaners is demolished and no longer will i visit that tropical garden of garment sleeves, with brightly coloured shirts and jackets and dresses slipped inside. those muted plastic flowers, waiting to be picked up. the owner, an agreeable elderly man who always had a bandaid on his hand, said he didn’t want to retire but what can you do? his skin was bleached up to his forearms and i catalogued his moles with concern. dry-cleaning fluids are carcinogenic. 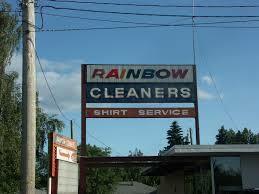 rainbow cleaners is demolished and so am i.